Russo and Steele always has interesting cars at their Scottsdale auction and it looks like the January 2013 version will be no exception. 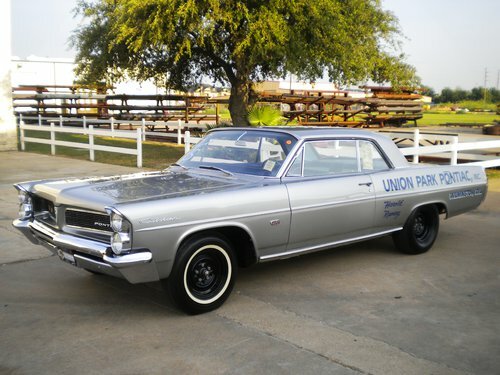 One of them is this 1963 Super Duty 421 Pontiac Catalina coupe. It’s one of a group of only 14 (only nine remain) known as the Swiss Cheese lightweights. The particular car at auction was raced as a Super Stocker in 1963 by Harold Ramsey. He then had the wheelbase altered so he could race in the A/FX series. It was later raced by Larry Johnson. The current owner bought it, still wearing its late ‘60s paint job, in 1997, and turned it over to Thorpe’s Body and Corvettes Shop of O’Fallon, Illinois. They restored it to original specs, a 3,000 hour job, after which it grabbed a 400 point score at the June 2010 Charleston POCI Nationals. It’s picked up a few more titles since then. It’s also documented in Pontiac Musclecar Performance 1955-1979 by Pete McCarthy and John Angelis. Russo and Steele say “the Swiss Cheese cars were equipped with the top SD 421 engine featuring 12.5:1 compression, Mickey Thompson pistons, a McKellar #10 cam, lightweight valves, high-flow cylinder heads, dual Carter AFB carbs, a special aluminum intake manifold, heavy-duty internals, and a lightweight flywheel. 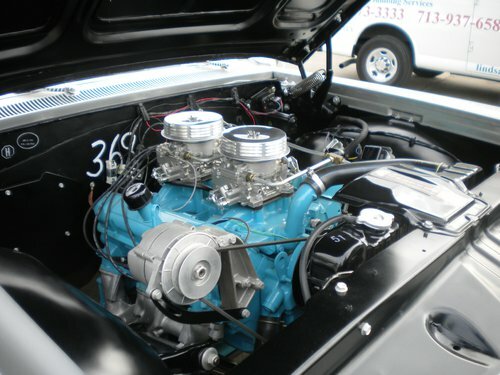 A heavy-duty Borg-Warner 3-speed manual transmission (with 2.10:1 first gear to prevent excessive driveline shock at launch) with aluminum tail housing and an aluminum center section for the 4.33:1 Safe-T-Track rear end rounded out the stout driveline.” That’s one serious drag racer. One of my most popular posts was about the Digital Car Painter iPhone/iPad app produced by BC-based Bestapp Digital Enterprises Ltd. Apparently, the app itself is quite popular with the hot rod community, too, but they’ve also provided a lot of feedback. The solution? Giving users the chance, for a small fee, to add photos of their own car using a “Custom Cars” button. The basic app is free, although there are small fees for the various add-ons. You can check it out at Digital Car Painter. How Do You Start a 1905 Cadillac? Judging by this video from the Reynolds-Alberta Museum, it’s a very complicated process. I’d figured there’d be a crank involved, but all of those other steps? And why would anyone put a lever on the back of a seat? Good thing the electric starter came along shortly thereafter—according to Wikipedia, Cadillacs had them beginning in 1912. Speaking of the Reynolds-Alberta Museum, if you’re ever in the area (it's not that far from Edmonton), it’s well worth a look. Besides a ton of great cars, they also have agricultural equipment and airplanes. Like most museums, not everything is on display at once. Your best chance to see the cars is their annual History Road event, generally held in June. Aston Martin Racing and The Racer’s Group recently announced a new partnership, TRG-Aston Martin Racing North America, LLC, to form a factory-supported racing program in North America. Apparently they’re planning on participating in the American Le Mans Series, the GRAND-AM Rolex Sports Car Series, and the GRAND-AM Contintal Tire Sports Car Challenge starting in 2013. In addition they’ll be starting a single-make support series using Aston Martin Vantage GT4 race cars. I’ve always thought single-make series were a great way to level the playing field and really show what the drivers’ skills are, so I think this is a terrific idea. The partnership has already acquired 10 race cars for the various series they plan to compete in. Look out for the Aston Martin Vantage GTE at the American Le Mans Series Winter Test (February 7-8), and again in the Mobil 1 Twelve Hours of Sebring on March 16. The Vantage GT3 will be showing up in the GRAND-AM Rolex Series, while the GT4 will take on the Continental Tire Challenge. As for the one-make series, it will use the GT4 Vantage in a sprint race format and may start by fall 2013.